Nearly giving up the day job-coming soon, my Etsy shop!! Spring is nearly here and with it comes some changes for me in my personal and work life which ultimately will be a change in lifestyle for me. This is my gorgeous Cherry Blossom tree in my front garden, always a visual reminder of how wonderful the start of Spring is and how inspirational it can be for the start of each year. I thought if I don't do it now I never will-I am apprehensive, wary, excited and nervous-but am preparing for my launch opening which I am hoping will be around the beginning of April. As you all know, I so enjoy thrifting for designer and vintage pieces and of course I will still be looking for finds of my own as well as the shop. But everything I source is specifically picked and indeed a piece I would use or wear myself, so if you like my style, I hope you will enjoy picking something from my shop to incorporate into your own wardrobe. Any pieces not suitable for Etsy-that is not vintage, will go onto Ebay and I will post a link once the items go on sale, also around the start to mid April. I do so hope you will take a browse when I launch and seriously consider treating yourself-watch this space for the Launch Date!! I am so glad that you are following your dream to the full. It is never too late. Grate news. baking you all the way. How exciting, I will be watching your new venture with interest (and maybe an open purse! )I have been toying with the idea of Etsy for a while, I'd be really glad to know how you get on as a British shop as the site has always seemed more geared up to American sellers (understandably). Folksy has opened up here for crafters, but it would be great if there was a similar British based website for vintage. Or maybe I'm imagining any difficulties and should just give it a go! Long time no see. Congratulations, it's nothing like doing things for yourself. Good for your! I think it's important to take the risk and follow your dreams. I know too many people who end up regretting not taking the leap earlier. Very excited to see what your Etsy store will feature. Knowing how great your finds are and your eye for vintage, I'm sure it will be fab! Good luck in your venture hun. What a great thing to do and very brave too! I am sure it will be a huge sucess and you have everyones best wishes (& hopfully pennies!). Oh wow! good for you, I've been reading your blog for a while and love all the wonders you manage to find, can't wait for yor shop, good luck. Wow! Congratulations, Sharon! I'm exciting with you and FOR you. My dear, it is scary and exciting at the same time to start a new venture! My advice to you is to incorporate, incorporate! I don't know the UK Laws but by incorporating you will protect your personal assets! really a very good idea, I'm eyeing with doing this myself but I'm always not brave enough ... maybe I will do, too in the future! wishing you all the best! Congrats! I've always wanted you to shop for me so this is perfect! Wowee! Good luck. I have already added your soon-to-be-launched shop to my favourites and will enjoy browsing there. YOu may get some inspiration from my own Etsy shop of vintage items & who know? perhaps we can even swap!! Fantastic idea, Sharon. I think this kind of business will be ideal for a gifted lady like you. I will do a lot of advertising for you. Great! Ciao. A.
Amazing! good luck with everything! HOW WONDERFUL & so exciting and fab!! It sounds so exciting! Good luck. It's about time Sharon! You've found such amazing pieces since you started this blog so it seems only natural to start your own Etsy and Ebay store! Good luck!! 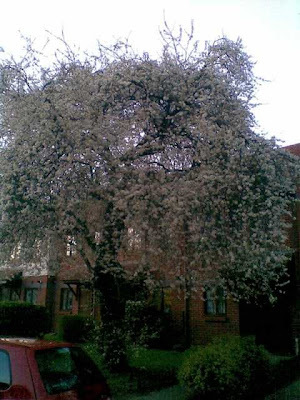 the cherry blosson tree is SO PRETTY@! My heartfelt good wishes to you on following your dreams. You go girl! I am so happy for you. So many of us dream of doing what we love, but so few among us have the courage. The cherry blossom tree must be such a lovely sight. How fantastic! I wish you every success. Although judging by your knack of picking up amazing thrifts you may not need it. You have such an excellent eye. Whenever I go to a boot sale or charity shop, I see a load of smelly acrylic horrors. But I bet if you went into the exact same shops, you would pick up the only decent thing in there that I'd totally overlooked! All the best, and I'm sure to be buying from your Etsy store! How exiting! Good luck, and I will definitely be one of your customers, you find the best things!